Our team are hand-picked from hundreds of applicants and making the grade is the equivalent to getting a first degree in partying. All staff are equipped with first aid, games knowledge and all things Queenstown. Listen to the MC – this is who will let you know when we are leaving each pub and club + will let you know when there is FREE pizza! Our professional photographers are keen to get as many snaps of the night as they can! Want a photo, just ask! If you want to win a prize, come and tell us! We have many ways for you to earn prizes, party games, dares, dance battle and the list goes on! Ask the bartenders for the unique drink offers! We organise exclusive drink discounts at each place so make sure you ask so that you can get the most value for your money! Join in on the party games! 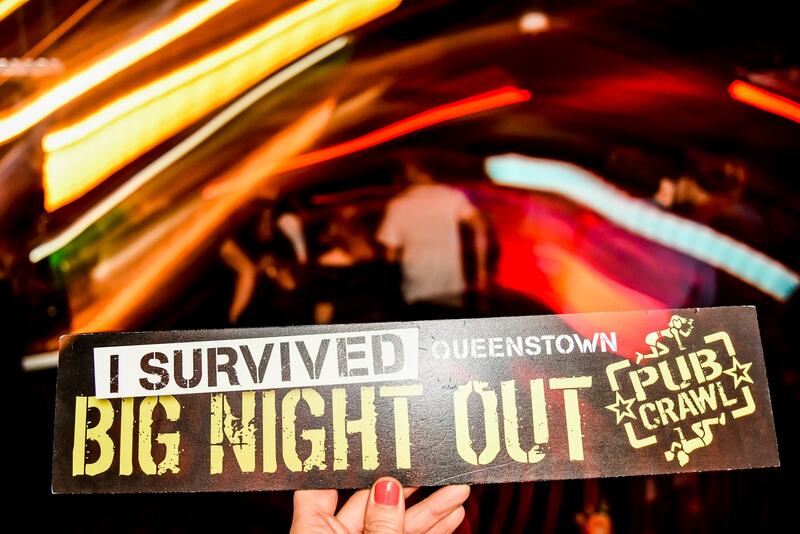 This is the best way to break the ice with other people on the crawl + you can win prizes & they are lots of fun! Know your limits! In other words, drink at your own pace! We want you to enjoy your night with us, but we also want you to remember it! Just ask! If you have a question, our amazing team are more than happy to answer any queries so just hit them up! They don’t bite! We highly recommend trying Devil burger it’s quick, tasty and they serve beer! Easily the best burger joint in Queenstown! Don’t leave Queenstown without having seen a sunrise or sunset from the beach. You won’t regret it! The 20” pizza challenge at Fat Badgers is epic! We suggest you give it a go otherwise and grab yourself a Badger bowl, it’s also awesome! The Big Night Out team recommend playing Frisbee golf on a sunny day down at the gardens as it’s free and a lot of fun! Cardrona ski field is unbelievable & 100% worth the extra money! Get super cheap fancy dress from the charity shop - Salvation army- for all the themed parties that Queenstown loves to host! Get all your bucks and hens party outfits from Budget 1-2-3 on Shotover street, Queenstown!